Have I mentioned lately that I'm Irish and no one in my family makes any food that's spicy? Despite that, I've been trying to eat spicier foods lately. Some things I've liked and others I haven't, but what's the fun of cooking if you aren't willing to try new things. I've been a fan of Sriracha, a Thai hot sauce, for awhile. It adds a nice kick to stiry frys and sauces. And since I use so little of it at a time, I'm going to have the huge bottle that it comes in forever. While surfing around one of my favorite blogs the other day - Meet the Shannons (a site devoted to veganism and veganizing recipes in Betty Crocker cookbooks) - I discovered a recipe for Brussels sprouts in a Sriracha lime sauce. I could eat Brussels sprouts every day and I'm always looking for a new way to prepare them, so I figured I'd give this recipe a shot. I find that simplicity is often good when preparing veggies, so when I read about the ingredients required to make these Brussels sprouts, I was a little skeptical. 1. Steam the Brussels sprouts and garlic in a large saucepan. Stir frequently. 3. Serve with a large glass of water. My thoughts on this recipe? Holy hotness! And I think this happened because I didn't follow the directions that Meet the Shannons provided. They said to cook the Brussels sprouts and then toss them in the sauce. 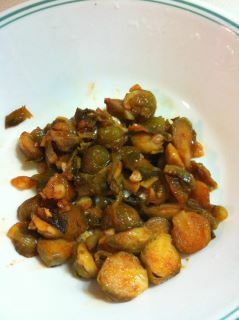 Since I cooked everything together, the Brussels sprouts really absorbed the Sriracha. My boyfriend liked the amount of heat that these sprouts put off, but I wasn't exactly a fan. I liked the flavor - lime first then the heat of the Sriracha - but if I were to make them again, I'd definitely cut down on the Sriracha. And possibly add a little more liquid smoke. I was afraid that I'd make them too smokey so I literally added a drop or two to the pan. I also skipped the lime zest, which may have helped to neutralize the Sriracha. Do you have any favorite recipes that include Brussels sprouts? Or Sriracha? I had the vegan risotto at Lago with brussel sprouts and it was fantastic!